Obed Asamoah To Run in 2008? Lens -- Dr Obed Yao Asamoah, the National Chairman of the NDC has dropped hints that he would not be seeking re-election as the National Chairman unless the party really wants him to continue serving in that capacity. Dr Asamoah however was evasive when questioned about his intentions as far the 2008 flagbearer position of the NDC was concerned. The NDC National Chairman was doing a telephone interview with Komla Dumor on Joy FM a few days ago. 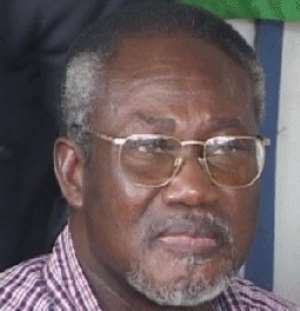 Dr. Asamoah, in an answer to a question, also poured cold water on the chances of his political protégé, Dr. Kwesi Botchwey, stating that the poor performance of the NDC in the central region in particular puts in a great doubt the chances of any Fanti aspirant for the position of Flagbearer of the party in the immediate future. It will be recalled that Dr. Yao Asamoah heavily supported Dr. Kwesi Botchwey during the NDC flagbearer contest in December 2002, which was massively won by Prof Mills when he swept the votes by nearly 90%. It would appear from the evasive manner Dr. Asamoah answered the question about his own interest in the flagbearer position, that he is pretty much determined this time round to have a shot at the flagbearer position himself. According to party insiders, Dr. Asamoah had intentions to be the party's flagbearer even for the 2004 elections. The only reason why he opted to throw his weight behind Dr. Botchwey was the serious jolt he suffered at the Congress that elected him to be the National Chairman. In that Congress, Dr Asamoah was so sure of getting an overwhelming endorsement from the delegates as a way of testing his popularity ahead of reaching out later for the flagbearer position. In the end he won the contest by only two votes and only because about ten valid votes of his opponent, Alhaji Mahama Iddrissu, were strangely rejected. In the same interview, the National Chairman of the NDC intimated that though the former President was such a tremendous asset throughout the 2004 campaign of the party, a few of his utterances did not help to win over many floating voters. Dr. Asamoah specifically made reference to the now famous “I will be back” statement made by President Rawlings at the Cape Coast Campaign Launch of The NDC. In his opinion this and other such statements played into the hands of the opponents of the NDC who were already desperate to push the propaganda that Prof Mills was only a surrogate for President Rawlings.